Williams Field or Willy Field (ICAO: NZWD) is the United States Antarctic Program's principal airfield in Antarctica. Williams Field is a snow runway located on approximately 8 meters (25 ft) of compacted snow, lying on top of 80 meters (262 ft) of ice, floating over 550 meters (1,800 ft) of water. The airport, which is approximately seven miles from Ross Island, serves McMurdo Station and New Zealand’s Scott Base. In addition, Williams is the major airfield for on-continent aircraft operations in Antarctica. Williams Field is named in honor of Richard T. Williams, a United States Navy equipment operator who drowned when his D-8 tractor broke through the ice January 6, 1956. Williams and other personnel were participants in the first Operation Deep Freeze, a U.S. military mission to build a permanent science research station at McMurdo in anticipation of the International Geophysical Year 1957–58. The skiway is typically in operation from December through the end of February. Other McMurdo Station airfields include the Ice Runway (October through December) and Pegasus Field used in August and December through February of each season. The Williams Field snow runway is known locally as "Willy's Field." The airfield is a groomed snow surface that can support ski-equipped aircraft landings only. A cluster of facilities for flight operations, referred to as "Willy Town," includes several rows of containers for workers and a galley. Some of the buildings are relocated to support flight operations at the nearby Ice Runway and distant Pegasus Field. Willy Field Tavern, a bar at the airfield, closed in 1994. Aviation fuel at Williams Field is pumped in a 16 km (10 mi) flexible pipe from McMurdo Station. Fuel is stored in up to 12 tanks. The fuel tanks, like other structures at the airfield, are mounted on skis or runners for portability. Generator and heating fuel is delivered to the station by fuel trucks from McMurdo Station, with fuels stored at the individual structures. The extraordinary conditions encountered at Williams Field include the fact that the airfield is in a continuous slow slide towards the sea. 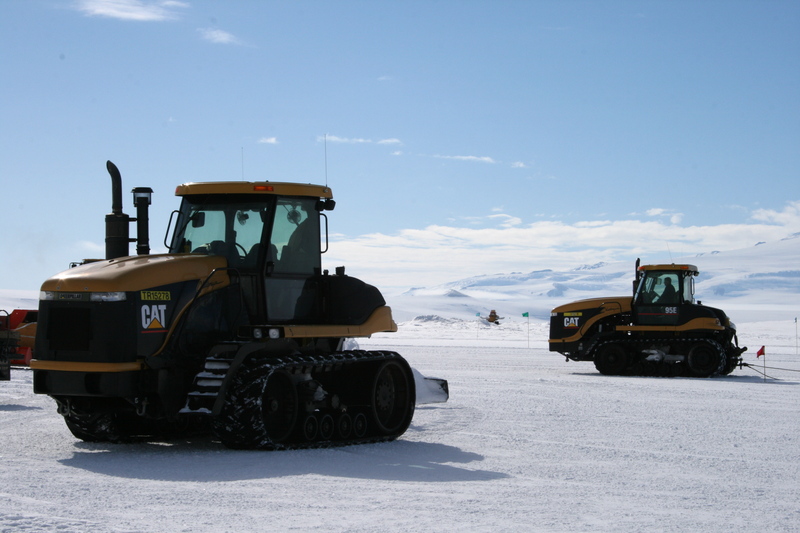 Seaward movement of the floating McMurdo Ice Shelf upon which the airfield is constructed has forced Williams Field to be relocated three times since its original construction. Workers last moved the airfield during the 1984-85 season. Subsequently, personnel housed at Williams lived in buildings constructed on sleds to facilitate relocation. In the past, up to 450 people were housed at the airfield, according to the National Science Foundation. In 1994 the National Science Foundation constructed two dorm buildings at McMurdo Station and began transporting personnel to Williams Field using various vehicles including Foremost Delta II and Ford E-350 vans. 1957: Pan American Boeing 377 Stratocruiser makes round trip from Christchurch to McMurdo Sound. First civilian flight to Antarctica. 1960: U.S. Navy WV-2 BuNo 126513 crashes after landing short of the ice runway. 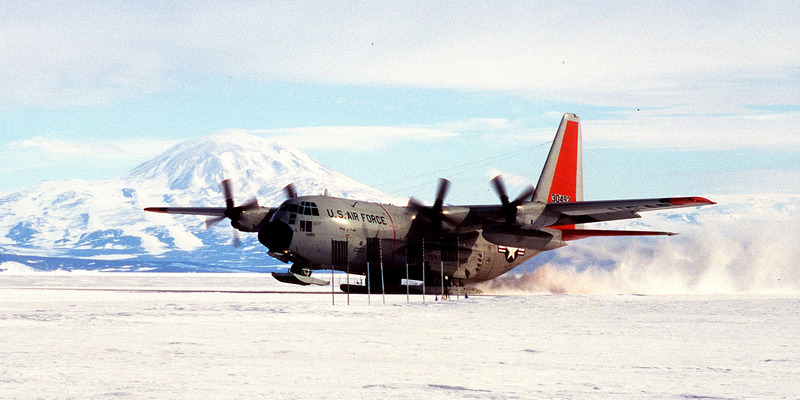 1960: First ski-equipped C-130 Hercules cargo aircraft lands in Antarctica. 1960: Sunspots knock out radio communications for eight days, forcing cancellation of all flights between New Zealand and McMurdo. 1966: First all-jet aircraft (USAF-C-141) lands at Williams. 1967: Earliest scheduled winter fly-in. 1970: U.S. Navy "Pegasus" C-121J crash lands. Aircraft is destroyed but no fatalities among the 80 persons aboard. Pegasus blue ice runway is named after this aircraft. MISC (2182 As rqr.) (4123 USAP). CNTR (9032 11256 5726 SSB) Grd freq cont mnt dur opr season, nml 1 Oct to 25 Feb annually. CAUTION Skiway brg strength surveyed for United States Antarctic Program (USAP) acft only - ALL OTHERS USE AT OWN RISK. Prior arng rqr for Austral win use; (See FLIP PLANNING AP/3). For addn info call C-1-843-218-5316/5757 . Posn and dimensions may vary wo ntc. LGT REIL/PAPI opr Skiway 25 and 33 only. SSALR opr Skiway Skiway 25 only.